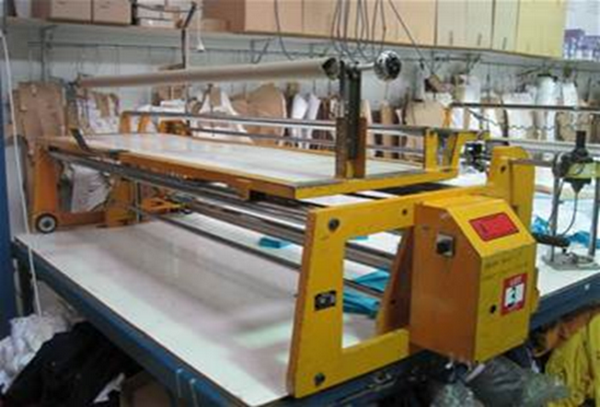 Semi-automatic is one of the types of mechanical fabric spreading method. Its plays an important role in readymade garments sector. Semi-automatic spreading has some advantages and disadvantages which are mentioned in this article. In case of semi-automatic fabric spread method, spreading machine is run on the rails which are placed at two side of the fabric spreading table surface and operated by motor. Here, fabric roll is set in a predetermined place of the spread machine and machine is run from one side to the other side of table by using mechanical and electrical motion to make lay. The maximum fabric width which can be handled is normally 2m although extra wide machines are capable of handling up to 3m. Auto ply cutting device here. Auto catcher to hold the ends of the ply. Photo electric guide for selvedge alignment. A platform is provided on which operator stands. Maximum weight of the fabric roll can be 80kg to 675kg. Maximum height of spread is 25cm. It has also rolled turning arrangement. Auto loading and unloading device. More time is required here. It has needed higher labor cost. It cannot be possible to make desired fabric spreading technique by using this method. There is no sensor in the spreading head. Any kinds of fabric cannot be spread here. Category: Garments Production Spreading Tags: Advantage of Semi-automatic Spreading Method, Disadvantage of Semi-automatic Spreading Method, Merits and demerits of Semi-automatic Spreading Method, Semi-automatic Spreading Method- An Overview, What is Semi-automatic Spreading Method?